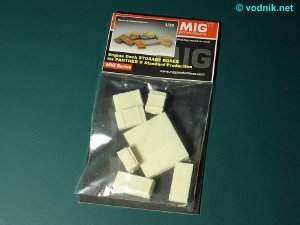 MIG Productions set MP35-113 is similar to set MP35-112 (Storage Boxes for Panther D Early), but it does not actually have any common parts with that set. 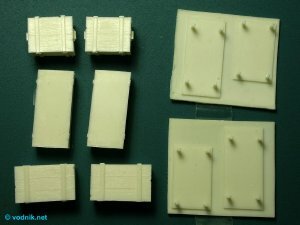 New set is also designed to dress up engine deck of 1/35 scale model of Panther D, but in different configuration from set MP35-112. The set comes in a plastic zip-bag stapled to the piece of printed cardboard. Inside the bag are ten cream colored resin parts. Fragile base plate parts are held together with a piece of scotch tape to protect them from damage. On the cardboard flap are several color photos of contents of the set and of various configurations of mounting of included parts on the Panther D model. All parts are shown painted, so pictures provide some useful color hints. 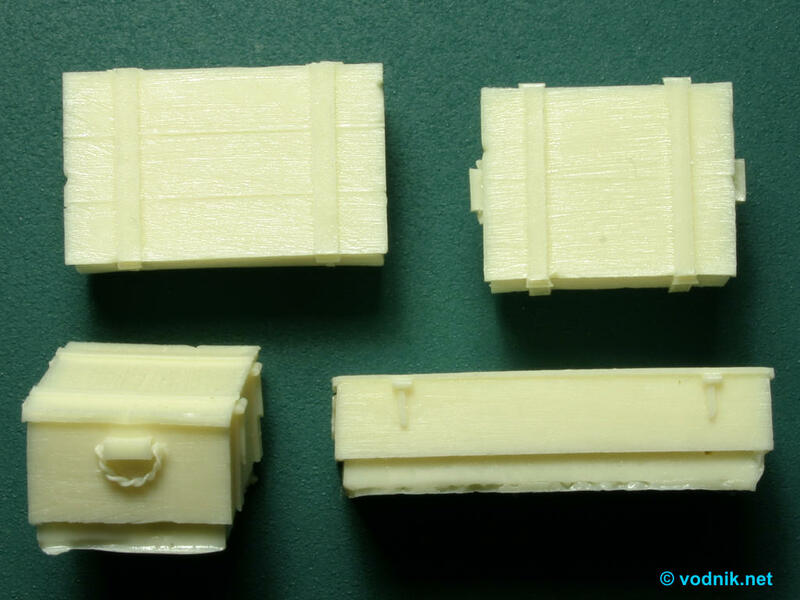 Included in the set are four base plates in two optional sizes, two of which should be attached to the engine deck of the model. We also get six crates in three sizes (four wooden crates and two larger metal ones). None of the included crates is identical to those in set MP35-112. Casting is flawless, with no air holes and no flash. Details are very crisp and nice lock, hinge and handle details are depicted. Subtle wooden texture is replicated on surface of parts where appropriate. Usual resin casting blocks are on all parts and to be removed by cutting or/and sawing and sanding. The base plates are molded with their flat plate parts attached on its whole surface to the pouring block (two plates on one block), what means that the only way to free them is tedious careful sanding to correct thickness. 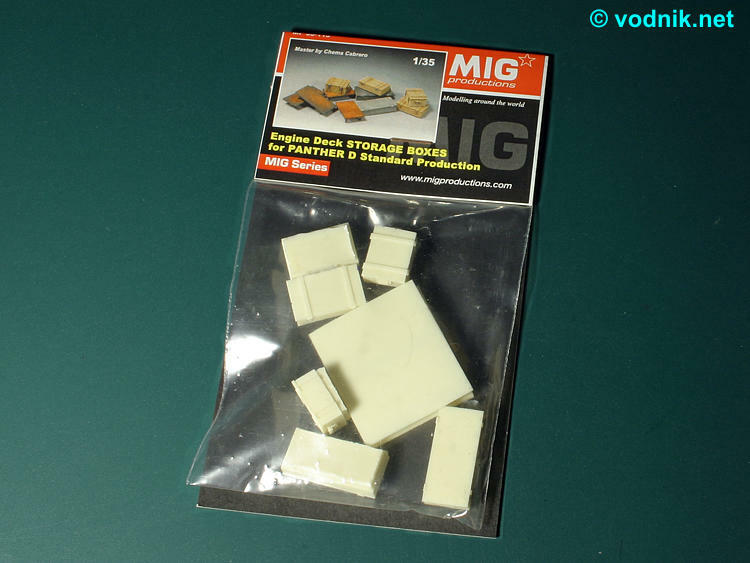 It is the most difficult part of preparation of parts and honestly speaking I would recommend using simple rectangular pieces of thin sheet styrene instead, with "legs" cut off from resin part or made from styrene rod. Click on picture to enlarge it. Close-up of details. Nice and simple set should be very useful to give more interesting look to Panther D model. Many thanks to Miguel Jimenez of MIG Productions for the review sample!